“We engage the public by educating, collecting, preserving, interpreting, exhibiting, and promoting art and history reflective of the American experience inspired by Maitland’s heritage and the legacy of André Smith’s Research Studio. Through our multidisciplinary collections, unique architectural environment, and inspirational programming, we stimulate thought, spark the imagination, enrich the spirit, and foster appreciation in art, historical research, and preservation.”…..
you can be assured this organization – Art & History – Maitland – is truly something special. The organization boasts 5 museums, everything from an 1884 Carpentry Shop & Waterhouse Residence, a Mayan themed Artist Colony, to an Antique Telephone Museum and much more. Ongoing art and history exhibits fascinate and delight the senses. Culture & Cocktail programs offer another unique view of what this organization is about. Couldn’t you use a bit of CULTURE right now? 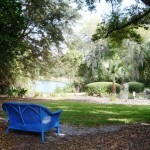 All museums are a short stroll or drive from Thurston House, North Orlando’s finest bed & breakfast accommodation. A Chickering at Maitland B&B! The front parlour of Thurston House, our North Orlando Bed & Breakfast, is home to a beautiful 1858 Chickering Square Grand Piano. 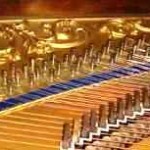 The Smithsonian Institution considers this exact model piano to be of such historical significance to include it in the museum’s “Piano 300” Exhibition now on display in Washington, D. C.
The Square Piano was the mainstay of the American home during the latter half of the 19th century, and the Chickering Company was at the very forefront of innovation at the time. Superior action design and the first patented use of the full iron frame provide this piece with tone quality and repetition speed unrivaled by most other manufacturers of this period. 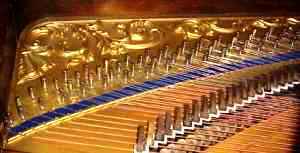 Brahms, Liszt, Strauss, and Tchaikovski were still composing in 1858, when this piano rolled out of Chickering’s Boston factory. Such Romantic era music can be faithfully reproduced on this period piano, and the cabinet beautifully reflects the early Victorian style. On loan from the Art & History Museums – Maitland, this beautiful piano graces the area of the front parlour polygonal bay windows. In the morning, subdued sunlight comes through the elegant lace curtains, making the entire room glow softly. Bed & breakfast guests appreciate the beauty of the rosewood case, and the interior decorative gold colored iron castings. 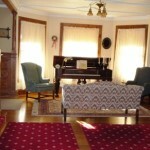 This piano is quite fitting for our circa 1885 home! Coming in September – Exquisite Harmony, works in collage by Elizabeth St. Hilaire Nelson. There is an opening reception Friday, September 10 from 6-8pm, then “Meet the Artist” on September 11th at 1pm. There is even a collage workshop planned for Friday-Sunday, October 22-24, from 10-4pm. Come and learn from the best, the artist herself! The Maitland Art and History Association at the Maitland Center has a lot of great events planned in the upcoming months! Latest Exhibition at Maitland Art Center! Florida Impressionist painter William Vincent Kirkpatrick was born in St. Augustine in 1939. The artist studied at the Maitland Art Center (originally called the Research Studio) with Lois Bartlett Tracy, who was a Bok Fellow (resident artist) in 1950, near the end of founder André Smith’s life. His entire estate and collection was kept by the family from the public until the last few years. This exhibition comes to Maitland courtesy of Baterbys Art Auction Gallery. This amazing museum facility is only minutes from Thurston House. 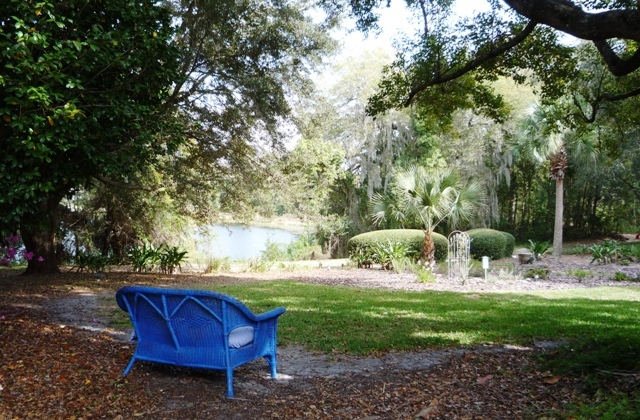 Add it to the list of must do’s when booking a room at our beautiful Central Florida Bed & Breakfast! Maitland Art Center -Open House! Explore the Historic and Architectural Charm of Artist and Founder, Jules Andre Smith, at the Maitland Art Center open house. 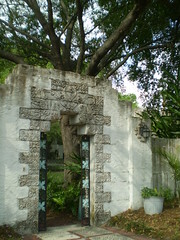 This State of Florida Historic Site is also on the National Register of Historic Places. Spring classes start soon so attend the open house on 3/13 to get more information about it all. 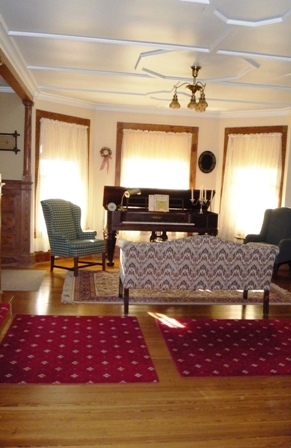 Our Thurston House bed & breakfast guests love that the center is just a pleasant stroll away!